"Yeah, I'm dead, but you really don't want to look away. Trust me, don't look up and to your left."" The horrors of virtual reality contact lenses. what's that cane doing here? 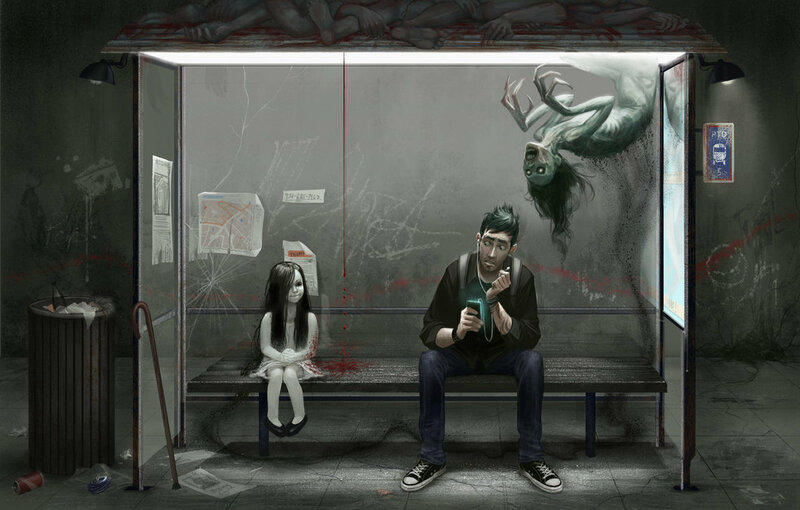 "And this is the last bus......"
"I should stop taking drugs..
"I should stop taking drugs.."
The spooks tried everything they could but the man's cell phone had already claimed his soul. And the lyft driver he's waiting for is named Christine. "I swear, this is the last time I am going to watch another horror movie with my girlfriend in the night." it could be the riddle of the sphinx and waiting for the bus..... child in the morning, adult in the afternoon, and rotten corpse by night...but then again when do buses run on time after waiting to get to work and I remember waiting for a bus and have it drive right by me with out of service light on !!!!!! ".....I really....REALLY hate Halloween in this Damned City....."
Correct! The answer is B, the gentleman in the centre, because he is wearing sports shoes. "Seriously, you can't hold it until we get home?" "What the heck? Is that blood?" If you look closely, the roof is full with corpses and the girl is connected with the critter by a darkish spooky aura. And the background shows some bloody parts and a graffiti with a weird person pictured.